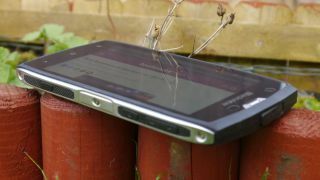 If you're after a phone that can withstand the elements, or survive accidental drops and knocks, then our list of the best rugged smartphones in 2019 is here to help. Not only are the best rugged smartphones money can buy water and dust proof, they also come in shock-resistant cases, which makes them ideal for working outdoors. If you're a fan of outdoor activities such as hiking, canoeing and climbing, then these brilliant rugged smartphones are a great choice as well. The Cat S61 is, in our view, the best rugged smartphone money can buy in 2019. This is a brilliant flagship phone in its own right, and it's a significant improvement on its predecessor (the Cat S60) in almost every way. At 162 x 77 x 13mm with a weight of 259g, this is a substantial piece of kit, and one that feels reassuringly solid and robust. It also features handy tools not found elsewhere, such as an indoor air quality sensor as well as a laser-assisted distance measurement tool, and it also comes with some decent smartphone specifications as well, including 4Gb RAM, a Snapdragon 630 SoC and a lovely 5.2-inch 1080p screen. It comes with Android 8.0 and will be kept updated with the latest versions of Google's operating system in the future. The AGM X3 is the third flagship rugged phone from the Chinese manufacturer, following on the X2, which is also listed in this best rugged smartphone guide. With the X3, AGM is looking to break into new markets outside of its native China. The company claims this is the most rugged smartphone on the market with IP68 certification, and not only is it tested to MIL-STD 810G standards, it's also noticeably lighter and thinner than many of its bulky competition. Not only is it impressively rugged, but it's also packed with the kind of tech we'd expect to see in flagship phones from the likes of Apple and Samsung, including a top-of-the-range system-on-a-chip, the Qualcomm Snapdragon 845 and bags of RAM. We were promised that the Doogee S90 would be unlike any other rugged smartphone on the market, and to be fair, that's what we got, with a modular design that lets you build a handset that best suits your needs. This modular approach means the Doogee S90 is bulkier than many of its competitors, so bear that in mind. In fact, you'd be hard pushed to find another rugged smartphone that offers anywhere near the amount of features – and battery life – that the Blackview BV9500 Pro does. It's solidly built, which does mean it's a heck of a bulky device, but what really makes the Blackview BV9500 Pro stand out above the rest of the rugged set is its comprehensive list of features that make it ideal for outdoor use.